The book that Nobel Prize winner Toni Morrison has called “required reading” appears at an auspicious time for race relations in the U.S. 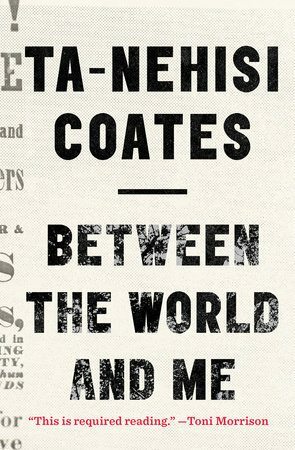 Between the World and Me, the sophomore release from Ta-Nehisi Coates, national correspondent for The Atlantic magazine, sounds a clarion call for a re-evaluation of the black American experience in the wake of the 2014 death of Michael Brown, an unarmed black man, in Ferguson, Missouri, and the refusal of a grand jury to bring charges against the white police officer who fatally shot him. The book is addressed as a letter to Coates’s teenage son, who, upon hearing that Brown’s killer would not face charges, retreated to his room where Coates heard him crying. Since the book has been in production, a series of other events – including the racially motivated murders of nine black churchgoers and a pastor in Charleston, South Carolina, and the suspicious death by suicide of Sandra Bland, a black woman who was inexplicably incarcerated for three days after being pulled over on a routine traffic stop by a white cop in rural Texas – have added urgency to Coates’s subject and message. So urgent is the message that one U.S. bookstore is selling the book at cost to encourage people to read it. According to Liam O’Brien of Melville House, Astoria Bookshop in Queens, New York, is selling the book at $14 (U.S.), a $10 savings off the publisher’s suggested retail price. By not taking a profit on sales of the title, the independent bookseller hopes to accelerate discussion and awareness of what is quickly becoming (thanks to social media and hashtags such as #BlackLivesMatter) a pivotal issue for the forthcoming 2016 U.S. presidential election. As soon as I finished reading the galley, I started telling people – friends, customers, my Random House sales rep – that I thought everyone I know should read it. I do not have that reaction very often. The idea to sell it at cost was an extension of that feeling. If I think everyone should read this book, how do I make that happen? And more broadly, what can I do to bring more people into this conversation? I’m not an educator, I’m not an activist, or a civil servant or a talk show host – I’m a bookseller. Buying new, hardcover books is a luxury for many people. And so it seemed like one small thing I could do is to make this book more easily available to more people so that they could also join the conversation. Ultimately, I just felt so strongly about Coates’s book that I needed to do something in response, put something out into the world.